We were at Sky's Osterley headquarters to take a look at its latest trial technology – Sky+ 3D – which the company believes could be the future of television. After being shown one of Sky's two transmission centres - where the double output that is then turned into 3D was being broadcast - we were taken to a room where the demo was held. 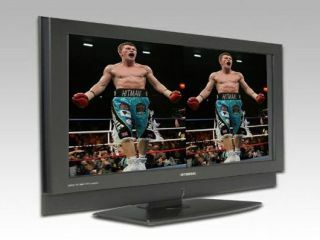 Although Sky declined to say what the television was, TechRadar's extensive investigation (we wrote down the word on the front) revealed that it was a Hyundai 3D television being used. We then donned the 3D glasses to view the product. The glasses were light but, as you can imagine, made everyone look fairly silly. It's an ongoing problem that may be a negative factor in home use. The opening salvo of clips were from various sports – including Rick Hatton's fight against Juan Lazcano, football and rugby. It is boxing that immediately catches the eye, with the tighter camera angles and more obvious focal point really bringing the 3D to life. In actual fact, the addition of depth really brings you into the action – especially when one of the fighters has his back to you. Less successful was the football, where the traditional wideshots seemed to make the 3D both less noticeable and, somewhat perversely, more distracting. In the rugby clips, the fast movements appeared to cause some unsightly blurs, but a clip of a try as the camera followed the action down the wing and over the line certainly had impact. The closer shots worked well, however, and footage of the crowd waving flags at the Kop of Anfield was among the most impressive 3D footage we were shown. Moving on, we were given clips from TV series Gladiators – making our sorrow at Kirsty Gallacher's exit even greater – and the advert for Sky+. Bizarrely, although the latter appeared to have had the most amount of post-production work, it actually brought to the fore one of the most clear difficulties for 3D television on the small screen. The problem is that when you can see the edges of a screen in 3D you have immediately problems when an item overlaps the edge – meaning it simply disappears from your field of view. In two dimensions this is less of a problem – but in three dimensions it does serve to break the suspension of disbelief and distract from what is going on. Obviously with the huge Imax screens you don't really see the edges of the screen unless you choose to focus there, but with a television screen – and to a lesser degree the Digital Imax and Dolby 3D screens – it is clear that simply bringing in footage that is meant for an immersive, huge screen, may not work quite as well in the home. It's a problem that Sky openly acknowledges, with Sky Sports' Darren Long admitting to me that lessons need to be learned – with cameramen operating the special 3D rigs quickly being educated in avoiding certain angles. Finally, we got to see the 3D camera – actually two cameras side to side in a rig pointing down onto a moveable mirror which apparently gives more control over the depth of field. The practical meaning of this is that the equipment does not cost the Earth - making it possible for Sky to investigate the potential without massive outlay. The live pictures of the room being beamed from the camera were actually very impressive, allowing the assembled journalists to get a sense of 'live' 3D pictures. We were cynical about the prospect of 3D television, and the truth of the matter is that there are some sea changes needed to convince the consumers that it's worth their while. The glasses are problematical, and the product has the added problem of defeating the overriding feeling that 3D is a gimmick. Will it enhance our viewing in sport? It's tough to say at this point; certainly for the boxing it improved the experience but the faster moving team sports were a long way from perfect. Entertainment seems to work a little better – although seeing ageing Gladiator Wolf in 3D may well be enough to scare the kids to an early bedtime. Sky are openly fishing for consumer feedback by opening up about their ongoing trials, and even at this early stage it certainly has the wow factor. 3D has risen up and drifted away several times in the past, and there's no guarantee that this won't happen again. But in trying something different, Sky has again pushed at the boundaries of television technology as they did with Sky+ and HD.